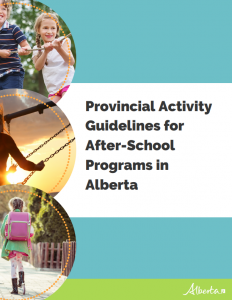 Check out the Provincial Activity Guidelines for After-School Programs below. For help with implementing the Guidelines see the associated Implementation Guide. For a one-pager that explains what the Guidelines are please click here. Are the Provincial Activity Guidelines ‘Required or Mandated’ by the province of Alberta? 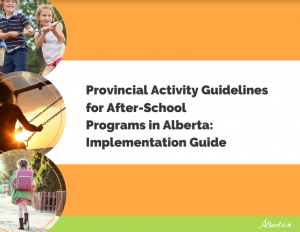 No, the Government of Alberta has sponsored the development of these guidelines and many after-school agencies and funders across Alberta are actively supporting and promoting the use of them. Are the guidelines for all ages? The guidelines apply to any program serving children and youth ages 3 - 17 years old. What about before school care? Full day programs? These guidelines assume that participants are also at school during the day and receiving 30 minutes of moderate to vigorous physical activity. On days where this isn’t the case (i.e., professional development days, holidays, summer programs/camps, etc. ), the recommendation within these guidelines should be shifted to 60 minutes of moderate to vigorous physical activity. Looking for ideas of physical activities you can implement in your programs? Check out the below Activity Databases or visit Ever Active Schools' YouTube Page. Over 850 activities you can search by age group, activity type, play area, group size, fundamental skills and adaptations. Simply search by any of those filters to generate a list with a set of step-by-step instructions for each activity. Have a great activity to share? You can even submit it to the database! Hundreds of activities that you can sort by age and skill. There are activities focusing on agility, balance, catch, dribble, gallop, hop, jump, kick, etc. If you’re looking for activities that can help you build a particular skill in your after school program, this is a great place to start! Sort hundreds of games by size, age, equipment, length and areas of interest. Each activity talks about developmental goals, set up, how to play and any variations you could use.